These are beautiful! The technique reminds me of those cones from Dairy Queen! OMG I cannot let Michael see these! 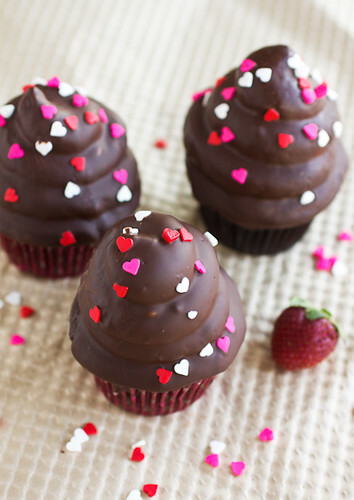 The boyfriend is gaga for chocolate covered strawberries and he’ll just faint if he sees these gorgeous cupcakes! Wow, this is an awesome amped-up version of hi-hat cupcakes. Such a great idea for Valentine’s Day! Thank you, Hobbit! 🙂 French crepes sounds amazing but what is Canadian tourtiere? I’m so curious! Tourtiere is a canadien meat pie ……..a traditional holiday treat that was often served Christmas eve after midnight mass along with cornichons. The combination of those little pickles and pork pie with winter spices is dear to the hearts of many canadiens. My heritage is French and I’ve been lucky to come from a family that enjoys keeping some traditions going. Perfect frosting:cake ratio, if you ask me! Oh my word- these look fantastic! I’ve made the frosting before but never tried to dip them in chocolate. I need to do this asap. Tara, I just love these!!! Brilliant!! 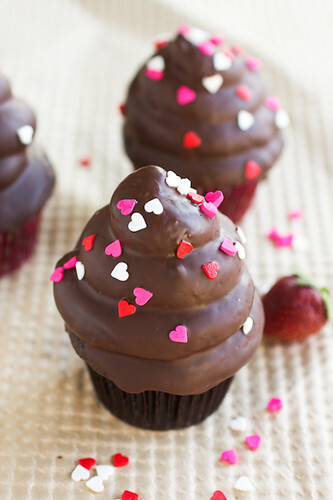 I’ve been wanting to make hi-hat cupcakes for years, but these look SO much better. You are a genius. Thanks, Josie! I know – the hi-hat cupcakes have been on my list for at least 5 years so I’m excited that I finally took the plunge to make a version of them! So cute! I’ll have to make these some time. 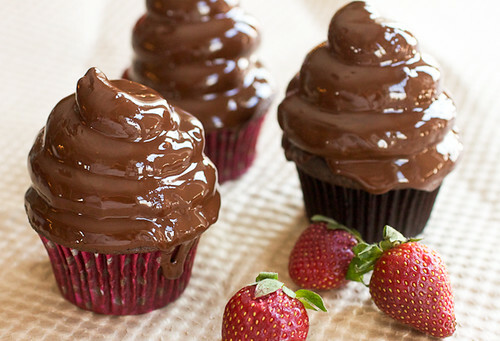 So often, I find chocolate and strawberry together in cupcakes doesn’t really work (I find the chocolate tends to overwhelm the strawberry), but dipping the buttercream in the chocolate seems like it will maintain that chocolate-covered strawberry feel and chocolate-to-berry ratio–perfect. 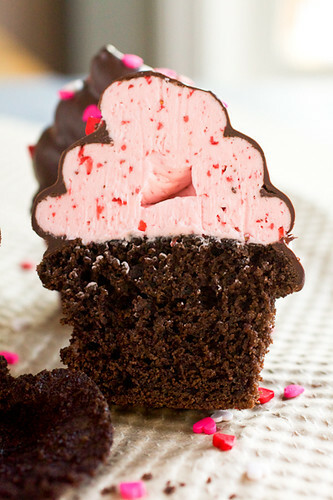 The chocolate cupcake here (well, devil’s food cake, really) is really just a great vessel for the strawberry frosting and chocolate coating. The cake doesn’t overpower the frosting and the coating with the frosting really does taste like a chocolate covered strawberry…only soooo much better because, well, it’s frosting! These look so wonderfully delicious and it’s a recipe of pure envy. I do not have a stand mixer (I know… SHOCK and AWE), but I would just love to make these cupcakes regardless 🙂 Would things need to be done a lot differently? Well, you can make the cupcakes by hand or hand mixer in a bowl but I think the frosting would be next to impossible to make by hand and fairly difficult with a hand mixer. The frosting requires at least 10 minutes of heavy whipping so consider that. You could always opt for an American butter cream and add strawberries to it (I’ve seen loads of recipes for this on Google) which could easily be made with a hand mixer. Good luck and let me know how they turn out if you make them either way! Hi, just found this YUMMY recipe on Bella Cupcake Couture Facebook Page! HOW yummy. Ordering some of their Cupcake Wrappers and making this for Easter Dessert! TYTYTY AND thanks to them! Do you think these could freeze? The whole cupcake, frosted and all? I really have no idea – I’ve never tried it. The cupcakes alone freeze great and I understand that the Swiss meringue buttercream freezes really well also. 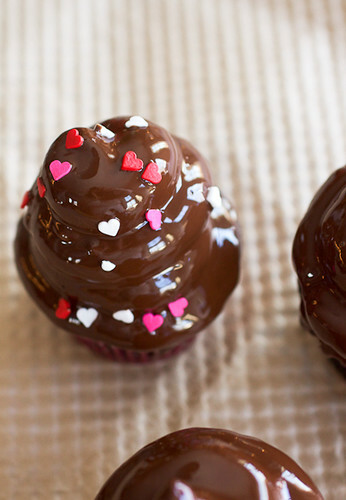 It would be a matter of thawing both, frosting the cupcakes, and dipping them when you need them. Hope that helps! Thanks, Tara… If the Swiss meringue buttercream freezes nicely I think they’ll freeze okay assembled.. that was the wildcard to me. I’ll be making these today for my sister’s rehearsal dinner in a month.. Just a lovely recipe, thank you! Definitely! And they would be completely adorable as minis! Sorry to hear you had trouble with the frosting. I assure you this frosting works. Swiss meringue buttercream is very temperamental and perhaps your puree was too warm or watery. You need to continue to beat the heck out of it if it starts to curdle and the frosting will come back together. I’ve made this recipe several times and know a few people who have as well and this has not been a problem for any of us. Thanks for chipping in with your experience here, Jennifer! Yes, Swiss meringue buttercream is a finicky frosting and it does take a bit of patience to whip it past the curdled stage. Currently in the process of making the frosting! However mine hasn’t curdled… is it supposed to? doesn’t work the cupcakes are still delicious!!! Frosting came up brilliantly. Gradually is key. This involves both the butter (at room temp) and the strawberry puree, one tbsp at a time!!!! Great to hear, Janny! Yes, slowly adding each is the key (though I don’t remember having trouble adding the strawberry all at once). The frosting is a labor of love but so, so worth it. Thanks for coming back to leave an update! I’ll be making these this week for my husband’s birthday. Thanks for sharing the recipes and your tips! I’m going to use my chocolate avocado cupcake recipe, but your cupcakes look good also. I made the frosting recipe, and used my own cupcake recipe and a different ganache. I wasn’t confident what 1 1/2 cups diced strawberries meant. Do I rough chop the strawberries, then measure ? Do I blend the strawberries in a food processor, the measure? … Etc. I looked at a similar Martha Stewart recipe that called for 12 oz of strawberries, so I went with that amount. The frosting turned out well, and it wasn’t too sweet or lacking flavor. Mine turned out a little thin for my preference, but I’m thinking now re whipping it after adding strawberries may help. Also, I wanted a moderate amount of frosting instead of the mound of frosting pictured here. I found that one recipe, 5 cups, was a good amount for 24 cupcakes.